These sites provide a sneak peek look at items submitted by agencies for publication in the Federal Register, including a PDF of the document and a date when the item will be published. Pursuant to the Federal Register Act, documents must be made available for public inspection one day prior to publication. Regular filings are available the day before publication and special filings may be available even earlier. The documents are updated every morning at 8:45 a.m. Eastern Time. 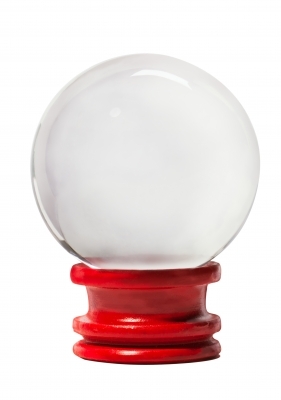 A crystal ball at your fingertips! Be sure to check the Federal Register for anything you find of interest, as agencies can and do withdraw documents from publication. For those too busy to check the website regularly, you can subscribe to the RSS feed or email alerts. Survival Guide for New Attorneys in California (2011) (64 pp.). This is a special issue of Los Angeles Lawyer, produced with the Los Angeles County Bar Association Barrister's Association. Although it's aimed at California lawyers, most of the advice is helpful to any new lawyer. Mark Herrmann, The Curmudgeon's Guide to Practicing Law (2006), KF300 .H47 2006 at Classified Stacks. Written by a partner in a large firm and published by the ABA, this little (138 pp.) book wittily offers advice particularly aimed at associates in firms but applicable to any practice environment. Click here for links to an interview with the author, a sample chapter, and more. No time to read anything as long as what I've just listed? Try this: Wendy L. Werner, Tips for the New Law Graduate, Law Practice Today, April 2012—it's just four pages. Did you know that students can join sections of the Washington State Bar Association? It's just $17.75 per section per year. You can learn more about your field of interest and who's active in the bar. You'll get a subscription to the section's listserv to see—a perhaps contribute to discussions. You might be able to answer some questions and begin establishing a reputation as a thoughtful, informed professional. You'll get leads for your professional networking. Take a look at the list of sections (Administrative Law, Animal Law, Business Law, and two dozen more!) and consider joining one. Are you a lazy law student when it comes to Bluebook citations? Citeus Legalus claims it can solve your problems! This website calls itself "The Legal Citation Generator for Lazy Law Students." You fill in the information and it generates a Bluebook citation. Created by a Cornell law student "[b]ecause there is absolutely no justification for the current Bluebook as it exists today" and because "[l]aw students have much better things to do than obsess over arbitrary abbreviations, rules, parenthetical orderings, and the like" it appears to be the answer to prayers of law students everywhere, but is it? The auction is a fancy shmancy event and chock full of cool stuff to bid on! A tour of the Gates Foundation and lunch with Bill Gates, Sr. is up for grabs! While the event will be great fun, it also serves a meritorious cause. PILA funds grants for UW law students doing unpaid public interest legal work through the auction. *Applause!! * The much anticipated event provides the legal community an opportunity to show their support by attending the auction, donating cash/items for auction and bidding on items for auction. I plan to show my support by bidding on one item in the particular, the gourmet dinner for six donated by UW Law Associate Dean for Library & Technology Services Penny Hazelton and former UW Law Reference Librarian Nancy McMurrer. Dean Hazelton, if you're reading this, don't be afraid to make it rain lobster and caviar. 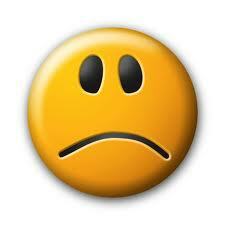 If the role of starving law student has left you a bit cash poor but you feel compelled to contribute to PILA, you can donate your LexisNexis Rewards Points to PILA! Hope to see you all tonight! SCOTUS says “A sniff is up to snuff. . . "
To demonstrate that an officer has a reasonable basis for believing that an alert by a drug detection dog is sufficiently reliable to provide probable cause to search, the State must present evidence of the dog‘s training and certification records, an explanation of the meaning of the particular training and certification, field performance records (including any unverified alerts), and evidence concerning the experience and training of the officer handling the dog, as well as any other objective evidence known to the officer about the dog‘s reliability. The trial court must then assess the reliability of the dog‘s alert as a basis for probable cause to search the vehicle based on a totality of the circumstances. The question—similar to every inquiry into probable cause—is whether all the facts surrounding a dog’s alert, viewed through the lens of common sense, would make a reasonably prudent person think that a search would reveal contraband or evidence of a crime. A sniff is up to snuff when it meets that test. And here, Aldo’s did. The record in this case amply supported the trial court’s determination that Aldo’s alert gave Wheetley probable cause to search Harris’s truck. Heart attack: May call for editorial liposuction! The test also provides an in-depth analysis of your writing sample. Words that fit in any of the grammatical categories are highlighted to give you an idea of how frequently you rely on them. The tool is not designed to tell you if your writing is good. Good writing, as Helen Sword notes on The Writer's DietFAQ site, can use all of the elements tagged in the tool and can use them well. But often, too many abstractions and passive constructions lead to some mighty snooze-worthy prose. Users might find a bone to pick with Sword's categories, which employ flawed assumptions about health and dubious one-size-fits all beauty and ability norms. However, don't let any offense here prevent you from exploring her tool--you may find it invaluable when it comes time to edit. 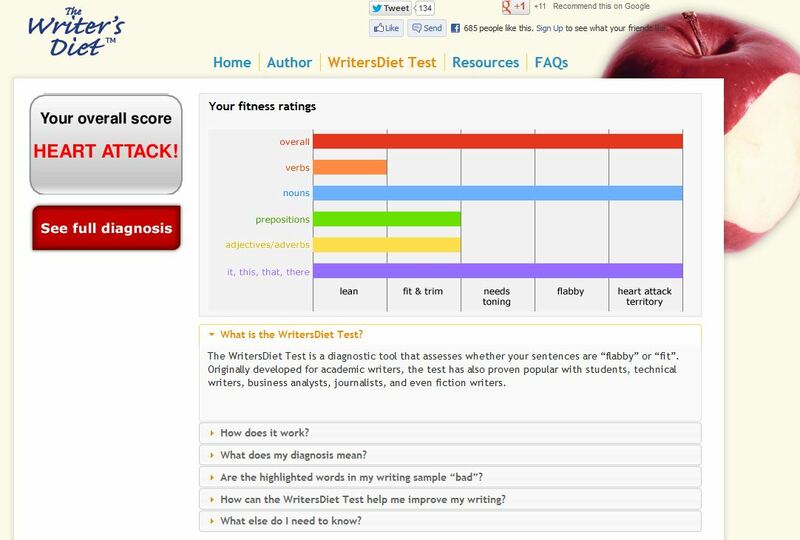 Check out the Writer’s Diet Testand see how your writing shapes up! The Law Library will be open from 8am until 5pm and the Reference Office will be open from 1-4 pm. Regular hours rule on both Saturday and Sunday, Feb. 23 and 24. As always, you can submit a question by email by clicking on the Ask Us link found on the top navigation bar of the Law Library website. We answer questions submitted in this way whenever the Reference Office is open. Enjoy your day doing something presidential or precedential! Gallagher Fun Friday: What is That Ball of Fire in the Sky? Could it be? Is the sun actually shining? Are you longing for a reason to get up from your table and leave the building? You're in luck! 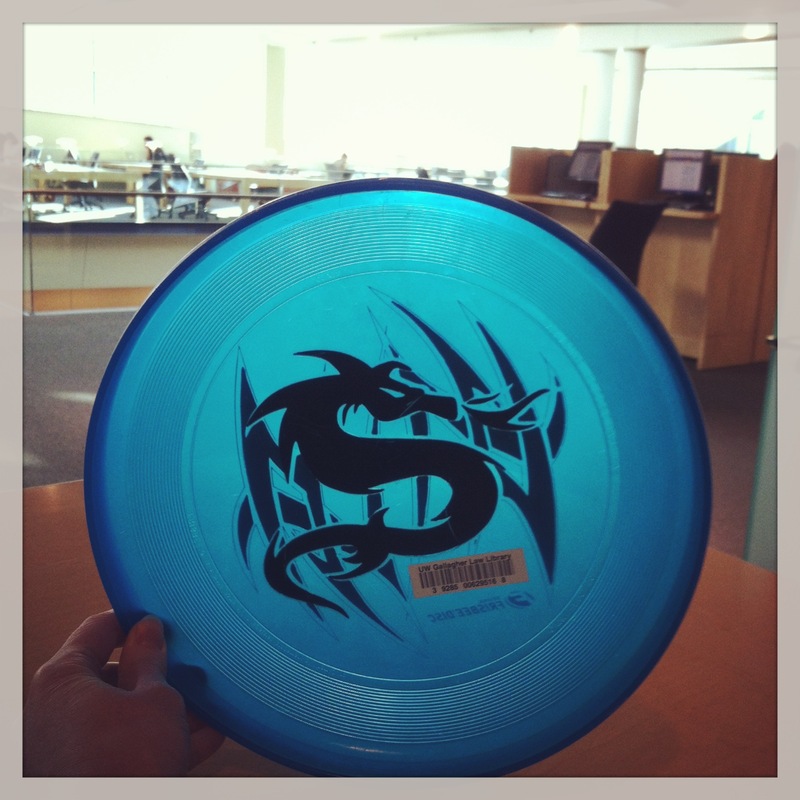 The Circulation desk has not one but TWO frisbees available for some tossing on the lawn outside. Stop by and check one out. I mean that literally. 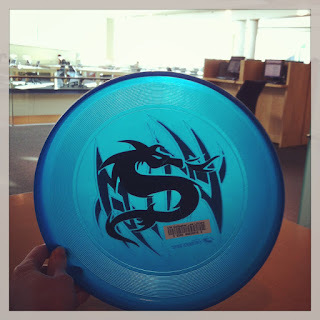 See the barcoded frisbee below (complete with disembodied librarian hand). Happy Friday, everyone! The "Intellectual Equivalent of a Pro-Wrestling Smackdown" (New York Times), IQ2 is a debate for the civilized. Legalize Drugs, Guns Reduce Crime, Global Warming is Not a Crisis, and other controversial topics are a few of the topics Intelligence Squared (IQ2) has covered. This week, IQ2 debated the topic, "Prohibit Genetically Engineered Babies." Click here to see the results and read on to hear how it works. Can You Predict Supreme Court Rulings? Gallagher's Fun Friday Tip: PUPPY BOWL!